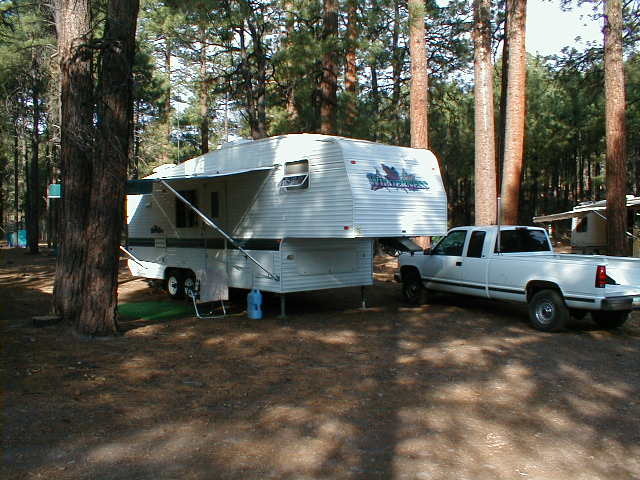 The portable QTH of W5JH is a 1999 27 foot Wilderness 27 5K 5th wheel trailer. It is self contained and fully equiped with a bathroom, kitchen with a 3 burner stove/oven, a refrigerator/freezer, furnace, Air Conditioning, 75 Watt solar battery charger, dual 12V/120Ahr batteries, and several antennas including a portable 40/20 meter dual dipole. The HF radio used is a Icom IC-735. The antenna can be assembled and erected by one person in about 10-15 minutes. The antenna attaches to the side of the trailer using wing nuts. The only tool needed to assemble the antenna is a 5/16 inch nut driver. No antenna tuners are needed or used. 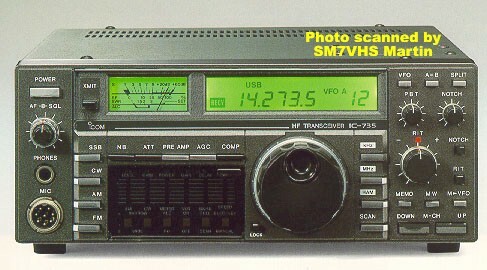 The VHF/UHF radio used is a Alinco DR-605T. Two antennas are used - a MFJ-1729 magnet mount dual band mobile whip and a homebrew 2 Meter J pole. The main purpose of the portable setup is to enjoy Ham Radio while camping/RVing and to provide emergency communications in time of need. The trailer can be hitched up and moved to the site of an emergency in a very short time. It is large enough to act as a temporary command post. The deep cycle batteries, solar charger, and radios can provide several days of emergency use without AC line power. This trailer is pulled with my 1998 GMC 2500 Sierra SLE.